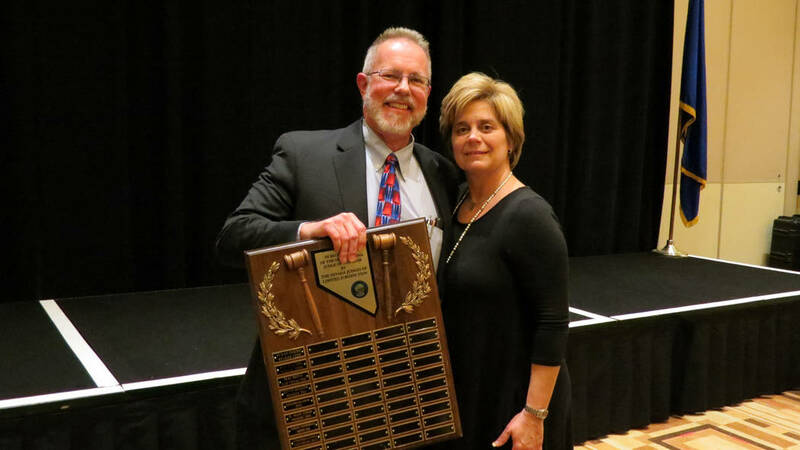 (Boulder City) Judge Victor Miller receives the 2018 Judge of the Year award from Judge Diana Sullivan of the Las Vegas Justice Court at the Nevada Judges of Limited Jurisdiction’s annual banquet Jan. 17 in North Las Vegas. Nevada Judges of Limited Jurisdiction is an organization that consists of all justice and municipal court judges in the state. Its mission is to provide the highest quality of service possible by their branch of government. Miller has served Boulder City as municipal court judge since 1984 and justice of the peace since 1993. He was recently re-elected for another six-year term. He also runs the Breaking the Cycle Rehabilitation Court that offers people who are in trouble with the law and suffer from substance abuse a way to rebuild their lives instead of going to prison. To date, 12 people have completed it with another three scheduled for commencement in February. In addition to being named the 2018 Judge of the Year on Jan. 17, Miller was appointed to the board of directors at the organization’s 2019 Winter Educational Seminar, held Jan. 15-18. He said his responsibilities as a board member will be planning the annual conference and its education opportunities. Additionally, this year he will work with the state legislature to let its members know how proposed laws would need to be implemented and how they would impact the judiciary. Miller automatically became part of the organization when he became a judge in 1984. It has approximately 150 members.